What's the solution to display a mind map in Excel? Is there an easy way to create mind map for Excel format? This tutorial will teach you how to make a mind map and export to Excel file. 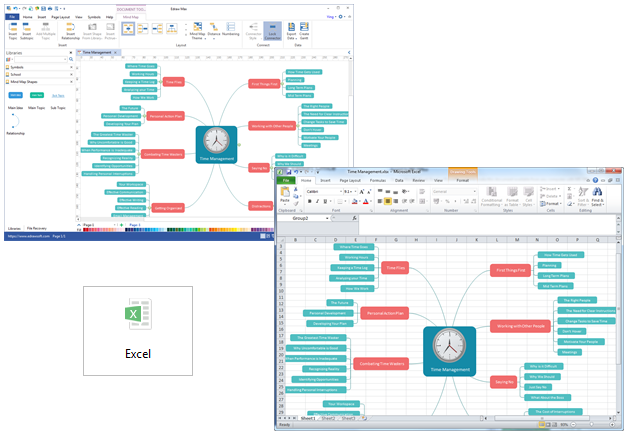 An easy way to create a mind map and display in Excel is to use Edraw mind mapping software. This mind map program is full featured, fast, and easy to use. With powerful export functions, it can export to Excel format without any quality loss. It could work on Mac, PC and Linux systems. Edraw provides a fast, smart and automatic way to create mind map. No drawing and no connecting, by clicking on the floating buttons you can quickly make a mind map with a perfect layout. A group of themes with different shape styles, lines and colors are available to choose. More advanced features like drill and hyperlink are also supported. It's well integrated with Microsoft Office, so the files could covert to Word, Excel and PPT easily. With smart mind map symbols and over 8000 built-in clip arts, you are able to make presentation-quality mind maps effortlessly, with no prior experience needed. Click how to make mind map for a detailed guide. Start Edraw, open a mind map drawing page. Drag mind map symbols from the library and drop onto the canvas. Or use the floating buttons on the shape to add sub topics automatically. Double click on the blocks to edit text. Lay out your mind map from the arrangement direction gallery. Add symbols, clip arts and local images for your mind map. Edraw helps you get started with your mind maps quickly, and export to Excel format instantly with one button click. As our mind map is compatible with Mircosoft Excel, you can one click to export the mind map to Excel format and with no quality loss. See the picture below. Just go to File tab, click Export and Send button and choose Excel to save your file as XLSX format. It supports Excel 2007, 2010 and 2013 versions. 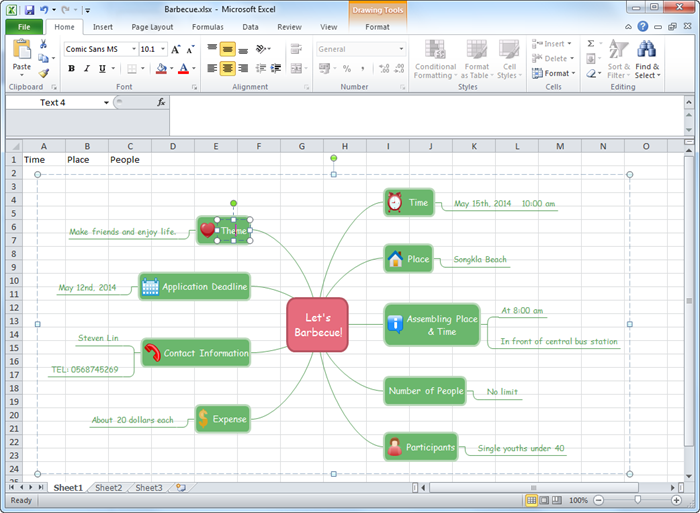 The exported mind map will remain the vector feature in the MS Excel. You can still edit text, recolor shape, and apply quick style in MS Excel.